Where to begin with these…hmm. 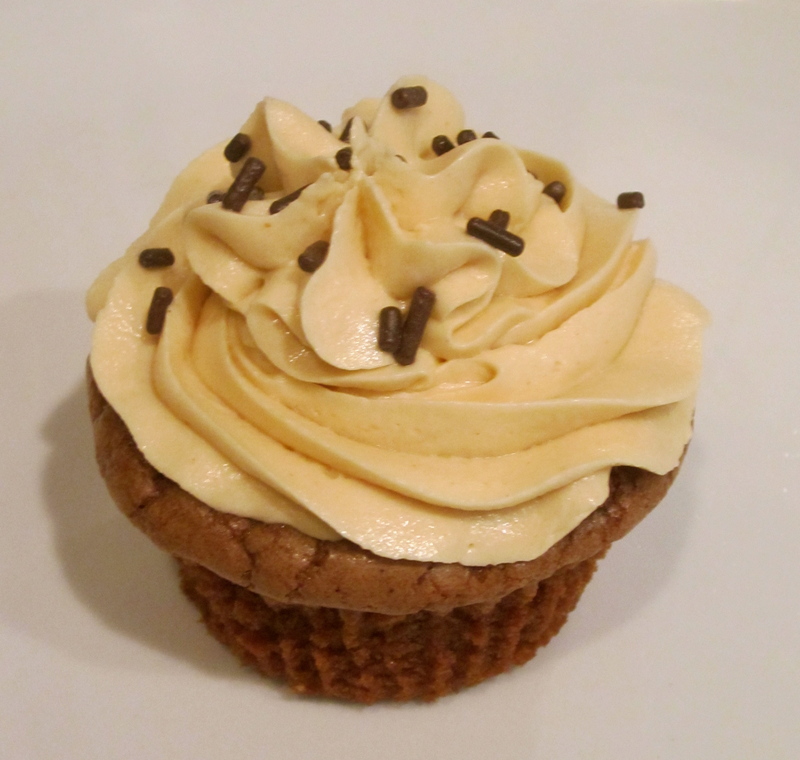 Well for starters, my chocolate – peanut butter craving was beyond satisfied with this recipe! The moist chocolateyness (I now dub this a real word) of the brownie combined with peanut butter gooeyness was perfection. 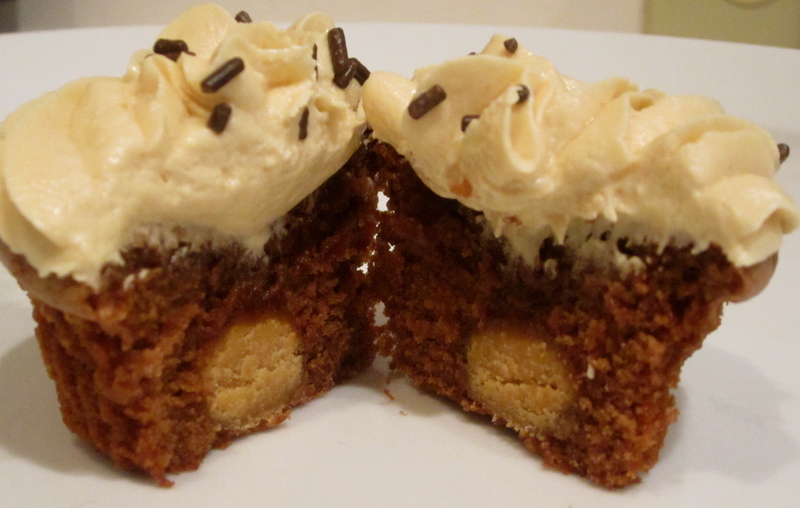 I promise you, the peanut butter filling of this brownie tasted identical to the inside of a reese’s peanut butter cup. 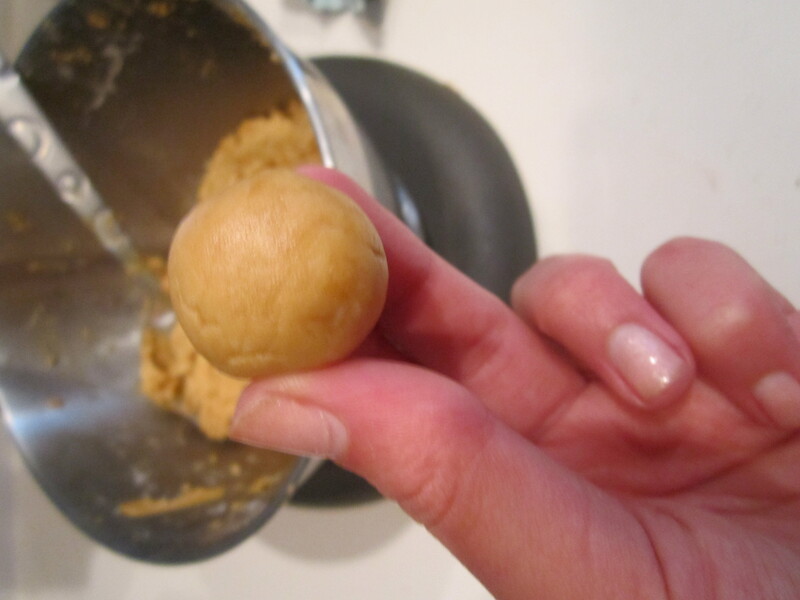 Seriously At one point I caught myself making a peanut butter ball and eating the next peanut butter ball, I was like a child who just couldn’t stop. 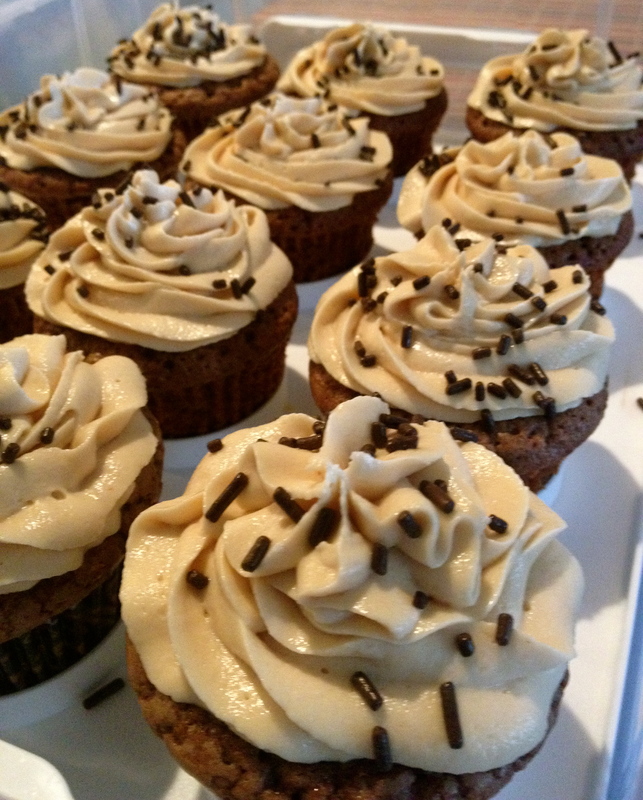 I was a little concerned about putting a peanut butter frosting on these – I thought it might be overkill. Thankfully, I was so WRONG! This frosting turned out fluffy and light – it completed the perfection of the brownie. 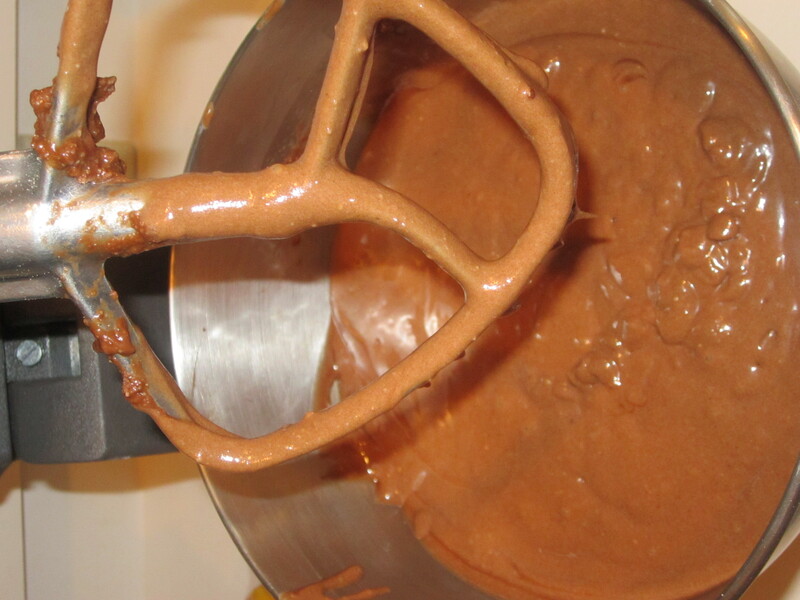 If you are a peanut butter and/or chocolate lover of any sorts – then try this recipe, right now. I promise they will not disappoint. Yum. I think I’ll go eat another one right now… make it stop! Preheat the oven to 350° F. Line two cupcake pans with paper liners (24). 2. Roll the mixture into 1-inch balls (at least 24) and set aside on a baking sheet. 5. Bake for 18-22 minutes, or until a toothpick inserted in the center comes out clean. Allow to cool in the pan for 5-10 minutes, then transfer to a wire rack to cool completely. 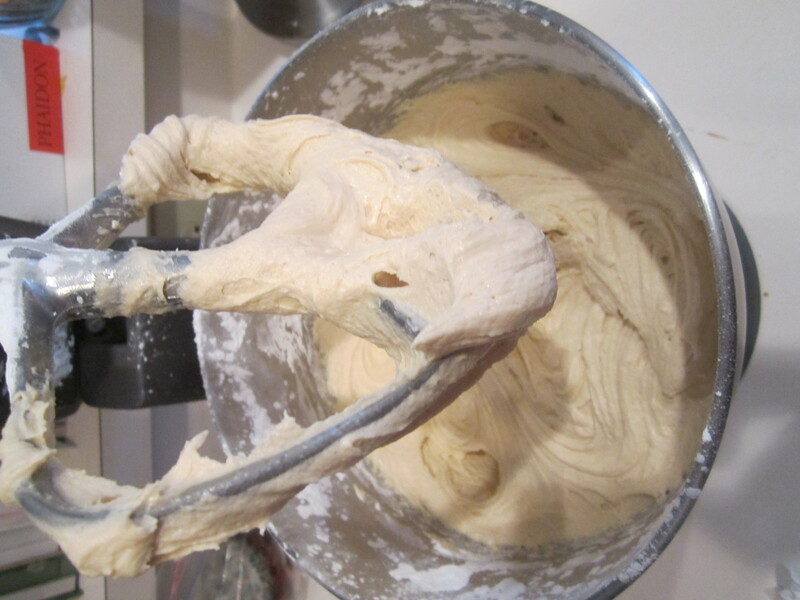 1 .Cream shortening and butter with electric mixer. Add peanut butter and vanilla. 2. Gradually add sugar, one cup at a time, beating well on medium speed. Scrape sides and bottom of bowl often. When all sugar has been mixed in, icing will appear dry. 3. Add milk, one tablespoon at a time, and beat at medium speed until light and fluffy. Frost cooled brownie cupcakes as desired. What a clever idea!! I’m a huge fan of Buckeyes (no…not just because I’m an Ohio State Buckeye fan). Well, OK, maybe that’s part of the reason haha. But these look awesome.